The San Diego Union-Tribune, which is reportedly being considered for sale, is going through another round of voluntary staff reductions. Exempt from this option is Sandra Dibble, a veteran journalist who arguably knows the Baja California border better than any other U.S. reporter. Sandra is all that’s left of the paper’s long-standing Mexico staff (reporter Leslie Berestein covers immigration out of San Diego, and Omar Millan writes primarily for the paper’s Spanish-language Enlace). Sandra and I used to work together at the paper’s Tijuana office. In December, I took a voluntary buyout and so did border business reporter Diane Lindquist. The company’s long-time Mexico City correspondent, S. Lynne Walker, also opted out. Since then, I’ve started this blog and graduate school. Diane created a border business web site. And S. Lynne Walker is vice president of the UCSD-based Institute of the Americas. The media landscape is changing drastically as the Internet creates new ways of sharing information and disrupts traditional advertising models. The paper’s decision to protect the lone-standing border reporter is both a hopeful and sad testimony to journalism’s struggle to survive. I recently wrote a paper on the past and future of border journalism, “Border Journalism in the New Media Age,” that was published by the University of San Diego-based Trans-Border Institute. For an interesting graphic on journalism layoffs and buyouts go here. Map image from Wikimedia Commons classified as being in the public domain. Friday, Aug. 29: A group of Baja California photographers celebrates the inauguration of their photo exhibit – Photo Sintesis – at 7 p.m. at the CECUT (that giant ball-like building just across the border on Paseo de los Heroes). The photographers are part of Lumina and Clickaphoto collectives. Free. Friday, Aug. 29: Las Pulgas, which is on Avenida Revolucion, celebrates its 20th anniversary with a lineup of norteno and banda groups, according to guiadetijuana.com. Cover should be about $10, according to the web site. To hear what norteno sounds like, click here; for banda, click here. Saturday, Aug. 30: A free yoga class for women will be in Playas de Tijuana (about 10 minutes west of the San Ysidro port of entry). The 9 a.m. event is sponsored by the city of Tijuana’s sports institute, which anticipates as many as 200 people may participate, according to El Sol de Tijuana. Bring your own mat to the malecon, which is the walkway near the beach (I would try driving by the border fence and the arches to see where the group is at). Note: This doesn’t appear to be a cross-border event such as the one held in June by the Border Meetup Group, (see video above). Saturday and Sunday, Aug 30-31: Tijuana has a Tattoo Expo with contests, seminars, and invited artists from around the world. 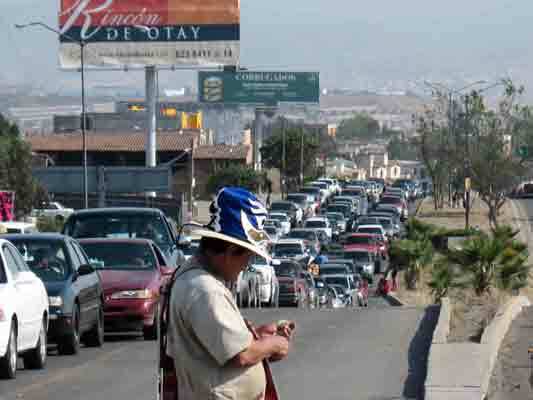 It should cost about $6 per day from noon to 10 p.m. at the Grand Hotel Tijuana. Learn more at www.tijattooexpo.com. Sunday, Aug. 31: A poster has been spotted around town announcing a bullfight, according to bullfights.org. I did a little Internet searching and it looks like the event will take place at the Plaza de Toros Monumental (Bullring by the Sea) in Playas de Tijuana at 4 p.m. Ticket information at http://www.plazamonumental.com/boletos. * Across the border does its best to verify this information but suggests visitors do their own research as well because venues change, errors can be made, and events cancelled. Tijuana’s Baby Rock was the mega-sized club to party at in the ’90s, attracting big names and big crowds. I remember celebrating a New Year’s eve here once with friends and meandering happily up and down the terraced floors filled with glamorous people. I don’t think I ever actually saw any of the Arellano-Felix drug cartel clan here, but it was the kind of place that drew people with that kind of money. To prevent problems, patrons were screened pretty carefully for guns and other weapons. Eventually, other warehouse-sized clubs started popping up in Tijuana, first Tangaloo and then Balak, which created some competition for the stalwart boulder. This summer I noticed that Baby Rock – known for its rock-like exterior – had lost the baby part of its name. This must have happened sometime after I stopped working in Tijuana in December because I’m pretty sure it was still Baby Rock back then. I would be curious to hear other people’s memories of Baby Rock – and what others think of The “new” Rock – which is located five minutes from the San Ysidro border on Paseo de los Heroes (near the statue of Abraham Lincoln). The New York Times ran a story this weekend about Alberto Capella, the city of Tijuana’s brash top law enforcement official who survived an attack by gunmen on his house last year by repelling them with gunfire before he even started the job. Being on the other side seems to have given him some perspective. While I have little doubt that Capella’s intentions are good, the power of the criminal underworld here places limits on what a person can do. Telling that story can be extremely difficult, but we all want to believe in a hero and people like him represent hope to the rest of us. For more on why it’s so hard to be a hero in Mexican law enforcement, read this indepth story about Mexicali police officer Jose Luis Montoya. When Vicente Fox was elected president of Mexico in 2000, the streets of Tijuana erupted in celebratory screams and shouts to mark the end of more than seventy years of rule under the Institutional Revolutionary Party. 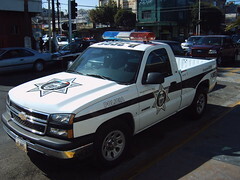 During his six-year term, Fox returned regularly to Tijuana and Baja California, a state that has historically been a stronghold of his National Action Party. As a reporter for The San Diego Union-Tribune, I caught up with him at the San Ysidro border where he announced a program to ensure a safe passage for Mexican-Americans heading south for the Christmas holidays. Another time, during a visit to a poor colonia, I trotted up to him to ask a question but he brushed me off. With all the bodyguards, convoys and the media mash of microphones and cameras, there were plenty of barriers between the president and me. This week, I had my chance to chat with the ex-president in Los Angeles during breakfast with a small group of USC (University of Southern California) deans and faculty. The meeting was held to discuss potential collaborations with Fox’s latest project, Centro Fox, a research and cultural center in his home state of Guanajuato. Afterwards, Fox mentioned to me his concern about Tijuana. We chatted a bit about his recent visit to Baja’s wine country, Valle de Guadalupe, and about his friendship with ex-Baja Governor Eugenio Elorduy. Manu Chao video from Krishalay Channel l YouTube. Aug. 22-Sept. 21: The Tijuana Fair kicks off at Parque Morelos, aka Morelos Park. It’s about a 15 minute cab ride from the border. Ballad-reggae artist Feliz Danilo Lopez will perform Saturday at 9 p.m (Aug. 23). Sunday, Aug. 24: The Caesar Salad Festival takes place on Avenida Revolucion, just a ten minute walk from the San Ysidro border. Festival will involve music, dance…and plenty of Caesar salad. Tijuana is said to have been the birthplace of the Caesar Salad. In this endless cat-and-mouse chase, sometimes surprise tactics work and sometimes they don’t. And occasionally innocent people get caught up in the system’s imperfections. Just ask a Mexican painter printer who was awarded more than half a million dollars in a case against the U.S. government, according to a story in The San Diego Union-Tribune. That episode started when he bought a previously confiscated car – with drugs still inside – from a government auction north of the border. When the drugs were eventually found at a checkpoint in Mexico, Rivera was arrested and spent a year in a Mexican prison, according to the article. Several other similar Kafkaesque cases emerged between 1999 and 2003 along this part of the border. Attorneys who represented Rivera told the Union-Tribune they believe the U.S. government has since improved its inspections of seized vehicles. In my own case this weekend, there was a moment when the Customs dog seemed to have a leaning towards one of the vehicles at the front. But after a few roundabouts he or she moved on and everyone who came with their cars left with their cars. Picture of cars waiting to cross into the United States from the Otay Mesa border.